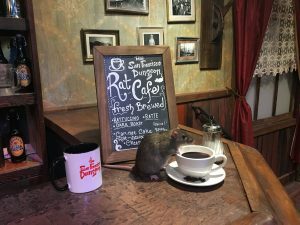 A new pop-up café will allow patrons to interact with and adopt rats after enjoying coffee, tea and snacks in the San Francisco Dungeon, a tourist attraction where actors recreate scary historical events. “We’re obviously following all food code and hygiene requirements,” the Dungeon’s Matthew Clarkson tells Eater. The Black Rat Café will be open for two days in July in the basement of the Dungeon, and tickets are $50 each. The food will be prepared off-site. The rats will be provided by Rattie Ratz, a Clayton, Calif.-based rat rescue and adoption agency. 1 Comment on "‘Rat café’ patrons can drink coffee, adopt rodents"